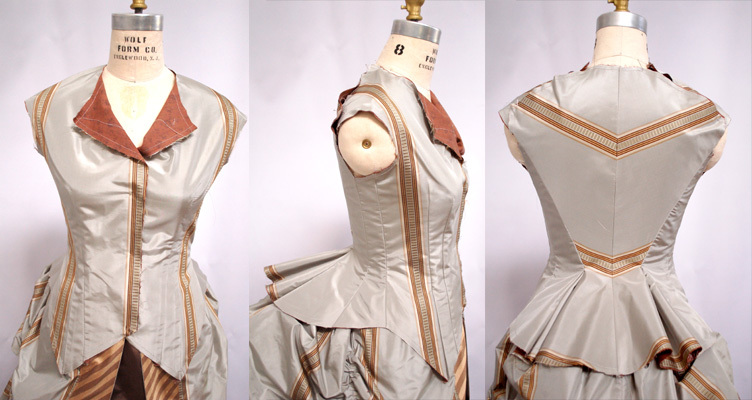 >I spent some of the weekend sewing on the Bustle dress! I had neglected it a bit last week, so it was nice to pick it up again. I did have to make several new changes to the pattern, especially since I realized I hadn’t sewn a Victorian gown in several years so I did have some different fitting issues than I remember having previously. I transferred the bodice with changes to manila papers it will be easier to make new versions and adaptions in the future by using it as a block. Playing with the stripes to make them not too much of a headache was a bit of a challenge. The space between the stripes is somewhat large, so figuring out how and where to place the stripes to make it not look strange or make them seem odd was a challenge, especially when considering how the skirt flares at different points because of the skirt and bustle. With more stripes it would probably be fine, but because there’s so few I was afraid it would just look odd and unevenly spaced unless I made it more simplistic. In the end I just took the easy way out- I cut the stripes to where they would make construction easiest on the front, cut the two side pieces without stripes, and used the back for creativity by placing a chevron. This is all interlined in brown cotton, so you can see that peeking through at where the lapel will be. Since the back is not cut on straight of grain I cut the interlining from straight of grain to keep it on track. Also, that stripe at center front may not show when it’s finished as I added extra seam allowance and that’s just where the pattern decided to line up. You can also see the line I decided to use for the bottom of the bodice. The previous version in muslin is here. Next up I’ve got to finish all those inside seams since this will be unlined, put in my boning, and fit it again before I can add the collar and facings.